U.S. airstrikes target the ISIS pocketbook. A suspect is in custody in the disappearance of a University of Virginia student. And Apple phones crash after the latest software update. Slick business: U.S. and coalition warplanes are going for the pocketbook as they attack ISIS positions in Iraq and Syria. Some of the latest airstrikes targeted what the Pentagon said were mobile oil refineries being used by the so-called Islamic State terror group to help finance its operations. ISIS reportedly makes up to $2 million a day from oil produced by the mobile refineries. Captured: The suspect in the disappearance of University of Virginia student Hannah Graham is in custody. Texas authorities found him camping along a beach in Galveston County, the sheriff's office said. The extradition process to return Jesse Matthew to Virginia has already begun, Charlottesville Police Chief Timothy Longo told reporters yesterday. Matthew was wanted on suspicion of abduction with the intent to defile in the disappearance of Graham this month. Authorities say they don't know where she is. On the bench: ESPN has suspended Bill Simmons for three weeks after he went on a profanity-laced rant about Roger Goodell. During his podcast, he called the NFL commissioner "a liar" and took issue with the National Football League's handling of the Ray Rice case. Simmons even called out his bosses, daring ESPN to censure him for his colorful Goodell spiel. Hey, be careful what you wish for. ESPN has suspended Bill Simmons. Core problem: Apple's first update to its recently released iPhone software didn't go so well. It withdrew the new update yesterday after widely reported issues that left some unable to use their phones. Now what? Some users posted on Apple's online support message boards that their phones were working again after completely resetting them using Apple's iTunes software. No indictment: Tony Stewart won't face charges in the death of sprint car driver Kevin Ward Jr., a New York district attorney said yesterday. Stewart's right rear tire hit Ward while he was walking on the track during an August 9 race in Canandaigua, New York. A lap earlier, Stewart appeared to cut off Ward, forcing him into a wall and knocking him out of the race. Ward, 20, died of massive blunt trauma before paramedics could get him to a hospital. Ward's family said it might pursue other legal options. - You're not from around here, are you? These giraffes seem perplexed by the appearance of a bunny in their enclosure at the Dublin Zoo. - The wisdom of a 4-year-old: Equality is really a very simple matter. Just ask Cleo. - Lost and found: This KLM service is going to the dogs. - School song: Be ready to be impressed. - Panda-monium: This involves a slide and four cute pandas. What more do you need to know? The transparent activities and daily updates on the campaign against ISIS goes against all logic in fighting a war. 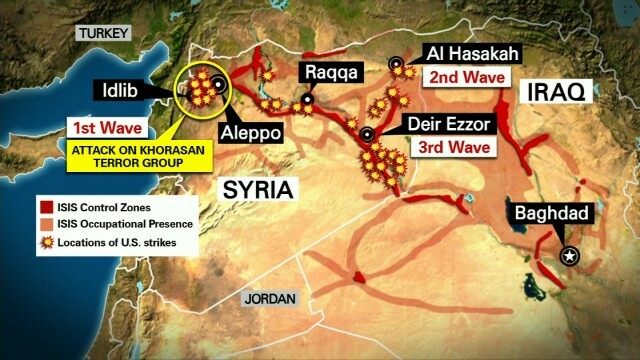 Every time global media posts maps, theorizes on the next days attacks or targets; the enemy simply watches and adjusts. People love their information but we seriously undermine our progress, and actually put our troops in harms way when the blatant positioning of airstrikes, bases being used, ships location, etc. The fog of war is a strong weapon against our enemies and eliminating that is dangerous, cost us more time to complete missions and teach the enemy warfare. Carrie Goldman Segall has a daughter named Cleo and the two made this wonderful video on equality. Unfortunately someone has stolen this video, scrubbed Carrie's branding from it, and is sharing it.....and making money off doing so. Carrie is the author of "Bullied" and this video originally appeared on her YouTube channel in tandem with a HuffPo article. Many of you know Carrie as a passionate adoption advocate and amazing mama of the Portrait Of An Adoption blog. Thank you to all of you who have found something to learn from my daughter Cleo. This video was made after Cleo and I were discussing stereotypes and race relations in America. It is NEVER too early to teach our kids about equality. To learn more about my anti-bullying work, go to http://www.carriegoldmanauthor.com. The information is available to those who wish to view it. CNN has not removed the identifiers. Out of the mouth of babe. Cleo is beyond her age. Inquisitive giraffes just wanted to get to know their bunny friend better. What perfect exercise for the pandas. KLM's lost and found service is brilliant. Can you please stop talking about lone wolves attacking the west. Do you really need to keep a spotlight on that. Be more responsible please – you make me cringe every time you give that idea a world stage. STOP! Why can't US airlines come up with something so simple and enjoyable as having a beagle deliver lost items? Wow, what a concept on Customer Service!